Just in time for Fourth of July, I’ve checked another from-scratch food attempt off the list: barbecue sauce. 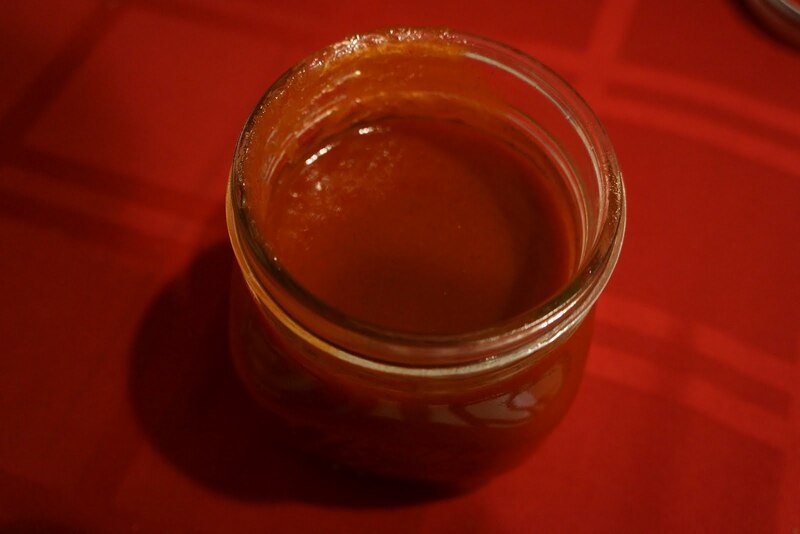 I’ve been obsessed for a while with making a barbecue sauce based on bourbon and vanilla bean. I like bourbon in barbecue sauce quite a lot, for the smoky-woody kick it provides. The vanilla is vastly less traditional, but there’s some method to my madness: “bourbon vanilla” is so-called, after all, because it smells an awful lot like bourbon. So I figured that the vanilla would bring out the sweet-and-mellow of the bourbon, and vice versa. If nothing else, it would be an odd little deviation from the barbecue sauce norm. I also knew I wanted to do a sauce that wasn’t ketchup-based. Nothing against ketchup–a burger’s not a burger without it–but I wanted to play with cleaner, less-processed flavors, the better to show off the flavors of whiskey and vanilla. So I decided to base my sauce on tomato paste instead. I opted for honey over molasses or brown sugar as a sweetener, to keep the flavor profile light and unmuddied. And though I was tempted to toss in a mess of spices, to make up for the complexity lost by not using ketchup, in the end I decided to keep things simple: smoked paprika, cumin, salt. The result of all this experimentation is a thick, bright, brick-red sauce. This one is more on the sweet-and-tangy side than the smoky-spicy side. I chickened out and only used a little vanilla, so that the flavor got a bit lost in the final sauce; I’ve adjusted the recipe to call for a whole bean. I’ve also been waffling back and forth about whether this sauce is too tomato-y–one taste and it’s fine, the next and it’s a little off. I may play around with that proportion next time. So for a first try? Not bad. Room for improvement? Yes. Bourbon and vanilla playing well together in barbecue sauce? Seems that way.